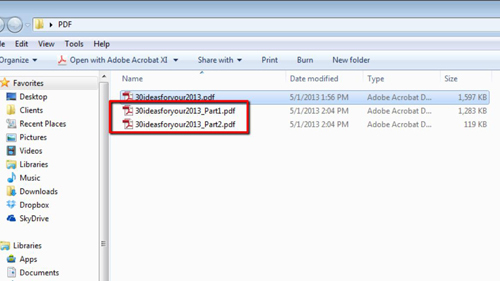 In this tutorial you are going to learn how to split a pdf so that you create two pdf’s from one original file. 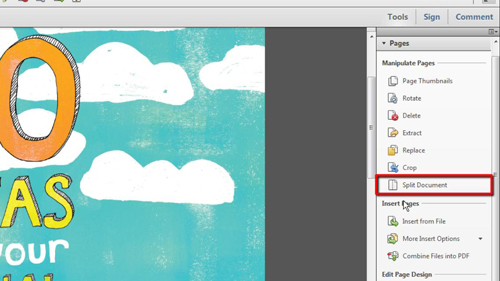 First of all open the PDF that you want to split in Acrobat Pro. Click on the “Tools” option and a menu will appear on the right. Click on the “Pages” tab and in the menu that appears click “Split Document”. 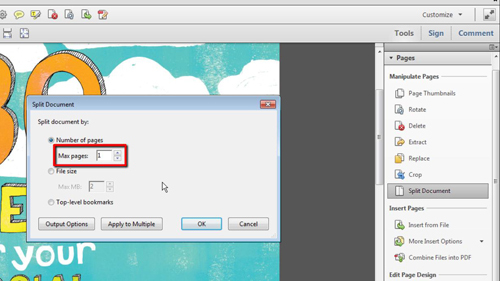 The “Split Document” window will open and you need to choose the number of pages you want your output PDF’s to be. Here we are opting to have them one page long each, which will split our two page PDF into two individual PDFs. Clicking “Output Options” will give you some more advanced settings, for example you can set a folder for the new files to be placed in, or you can select a custom name for the files. Here we are just using the default settings, so we will click “Cancel”. Click “OK” in the previous window and you will be told that the file has been split. Navigate to where the file was located originally, you will see that there are two files one with “Part1” written after it and one with “Part2” and that is how to split a pdf using Acrobat.